Shakespeare’s Mortal Men (prose). She has published widely in journals and anthologies, including Boulevard, Verse, BOMB, Pleiades, POOL, American Letters & Commentary, and The Literary Review; she has received fellowships from The MacDowell Colony and VCCA. She teaches literature and poetry writing at The New School and co-edits the poetry journal Barrow Street. We went Behind the Sestina to talk to Carlin about her poem, “Lives of the Conquerors,” featured in The Incredible Sestina Anthology. I first encountered Sir Philip Sidney’s double sestina “Ye Goatherd Gods” in college. It seemed a formal and historical curiosity, and otherwise uninteresting. Later I came across John Ashbery’s “The Painter,” and was instantly captivated by the possibilities of the form. For a while I wrote sestinas obsessively (after all, it’s an obsessive form). Any form is a constraint that moves work in directions it wouldn’t otherwise take; but in my current work I’m exploring a variety of invented, rather than received, constraints. Each time I write a sestina I see afterwards that there’s a close connection between form and content, although it’s a different connection in each poem. In “Lives of the Conquerors” the form mirrors the unrolling of history, where things keep coming back, but they never come back the same way. I remember writing this poem with Iraq very much in mind. In the actual process of writing, though, I was guided by intuition, which is to say I used the end words as a kind of Rorschach blot leading me on. I was also listening to the sound of the poem, as I do any time I write. When I have the sound I know I have the poem. This sestina is concise and uses its words sparsely. Was this intentional or something that happened while writing? The concision of this sestina, and what you refer to as its sparse use of words, came from my sense of wishing to distill enormous cycles of time and history, and also from my related sense of all the lacunae in the historical record: those gaps where individual lives vanish into unrecorded nothingness, as do the lives of all rulers, since only remnants ever remain. I don’t know who I’d dedicate this sestina to–maybe to all of us, piecing out our lives in the little spaces of time and the times. 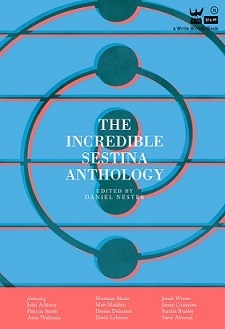 This entry was posted in Behind the Sestina and tagged Arts, Behind the Sestina, Forms, John Ashbery, lives of the conquerors, patricia carlin, Poetry, Sestina, The Incredible Sestina Anthology. Bookmark the permalink.